This item is design by Lighting Efficient Design to perfectly match both wall packs and "shoe box" fixtures. 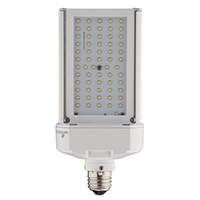 Its intensity of light and light distribution makes this retrofit a superior choice in comparison to standard "corn lamp retrofits". The retrofit features Advanced Active Cooling technology from Lighting Efficient Design to deliver a long lifespan and high LED efficacy when installed in enclosed fixtures. Additionally, the fuel caBypass ballast is designed for simple installation. You will receive 6,073 lumens of light output from only 50 watts. This item is cULus listed and comes with a 5 year warranty.